Key Difference: Hard water is water that has a high mineral content, commonly magnesium and calcium. Soft water is water that has a higher sodium content and small concentration of calcium and magnesium. Ever go to someplace new and notice that the skin starts to feel rough and dried out after showers or it takes too much soap to remove dirt from the skin or the water may even taste a little different? Well, that is because of water being hard. Another type of water is soft water. These two are distinctly different types of water. Hard water is water that has a high mineral content, commonly magnesium and calcium. The water becomes hard when it picks up concentrations of magnesium and calcium when it flows among these rocks. The rocks are often soft which results in them being picked up by the water. Hard water is not harmful for consumption and National Research Council (National Academy of Sciences) claims that hard water can actually serve as a dietary supplement for magnesium and calcium. The hardness of the water is measured in levels, which is determined by the concentration of multivalent cations in the water. Multivalent cations are cations that have a charge greater than 1+. Cations found in hard water include Ca2+ and Mg2+. Soft water is water that has a higher sodium content and small concentration of calcium and magnesium. Soft water travels through hard rock such as granite and hence gathers only a little amount of minerals. The water is believed to be better on skin, clothes, dishes and things that constantly need washing; however it provides no extra benefits during consumption. 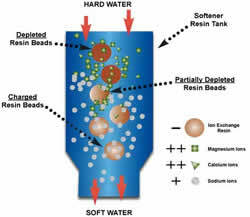 Hard water and soft water can easily be separated using a small observation. If while showering, the soap does not lather as much and leaves behind soap scum, most probably the person is bathing in hard water. Soft water does not leave residue behind and provides are luscious later. Hard water can also lead to calcification of faucets and pipes. In case a person does not wish to have hard water, the water can easily be softened using water softeners. Water softening appliances soften water by removing metal cations and replacing them with sodium or potassium ions. These appliances can be used in select places so that a person can use soft water for laundering and showering and hard water for consumption. Hard water contains high amount of calcium and magnesium. Soft water contains high amount of sodium. Hard water is a good source of calcium and magnesium in the body. Hard water also reduces the solubility of toxic metal ions. Soft water is not harsh on the skin, clothes, dishes, etc. Hard water can leave the clothes rough and worn out during washing; hard water also makes it difficult to take off dirt from the skin and leaves a film on skin and dishes when washing them. Build up of limescale and galvanic erosion are also problems caused by hard water. Soft water does not give off any problems, though it is less beneficial than hard water in consumption. Softened water is also known to emit lead from old pipes in the supply system. Thanks. I've cleared my doubt. But why does soft taste better than hard water? I've always been confused by these differences. Thanks. more differences are required but a nice article. it is very doubtful but nice explanation is given.